You will need a 4-litre deep flameproof and ovenproof casserole dish with a lid. Preheat the oven to 160°C/320°F/Gas Mark 3. Heat 2 tbsp of the oil in the casserole dish, add the beef and brown all over on a high heat – do this in batches. Pour in a little more oil if needed and add the shallots with the carrots and mushrooms. Stir-fry over a high heat for 4-5 minutes. Measure the flour into a bowl and gradually whisk in the ale. Return the meat to the casserole dish, then pour in the flour mixture and the stock. Stir over a high heat until the liquid is bubbling. Add the onion marmalade/chutney, Worcestershire sauce, gravy browning (if using) and bay leaves. Season with salt and pepper, then stir as you bring it back up to the boil and allow to bubble for a couple of minutes. Cover with the lid and transfer to the oven to cook for 2-2 ½ hours until the meat is tender. To make the dumplings, measure the flour and suet into a bowl and season with salt and pepper. Stir in 125-150ml of water to make a dough. Transfer to a floured surface and knead. Roll into a rectangle about 15x25cm. Spread horseradish sauce on top and scatter with parsley. Roll up the dough into a Swiss roll. Chill in the fridge for 45 minutes and slice into eight. Take the meat from the oven and increase the temperature to 220°C/428°F/Gas Mark 7. Put the dumplings on top of and cook for 25 minutes. Remove the bay leaves and serve with buttered cabbage. You will need a 20cm round spring-form tin with deep sides, and a piping bag fitted with a plain nozzle (optional). Butter the base of the tin and line with a disc of baking paper. To make the base, measure the biscuits into a resealable freezer bag and use a rolling pin to crush into fine crumbs. Heat the butter in a small saucepan over a low heat until just melted. Add the crushed biscuits and sugar and stir until combined. Spoon into the base of the prepared tin and level. Chill in the fridge while you make the topping. Break the chocolate into a separate bowl and sit it on top of a pan of simmering water. Stir until melted but not hot, then leave to cool down for 5-10 minutes until cool but still liquid. Meanwhile, tip the mascarpone into a bowl and mix with a spatula to loosen so it is soft. Stir in the cream and vanilla extract, stirring with the spatula until smooth. 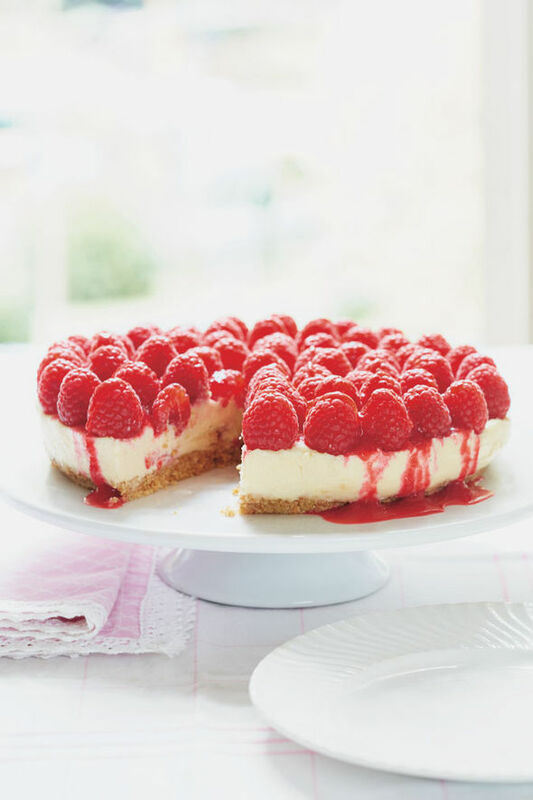 To make a coulis for the top of the cheesecake, place half of the raspberries into a small blender. Add the icing sugar and whizz until runny, then pour through a sieve to remove the seeds. Pour the melted chocolate into the bowl with the mascarpone mixture and stir. Spoon half the white chocolate mixture on to the biscuit base in the tin. Make a few small holes in the white chocolate mixture, pushing down on the top of the base. Pipe the coulis into the holes to fill them, setting aside the rest. Smooth the remaining chocolate mixture on top, and chill in the fridge overnight. Serve with raspberries on top and a drizzle of coulis.